Most subnational flags were abolished or abandoned in 1935 with the adoption of the November 1935 flag laws. I wonder if somebody could produce a more specific and detailed account of this abolition of subnational flags in 1935. I recall running into an authority with an explicit statement which I cannot locate now. For the rest, the Nazis (as opposed to some of their more traditionalist allies) were rigid centralists in their governmental views and as they worked themselves loose from their allies in the 1933-35 period, they altered the nature of Germany from a federal to an extremely centralist state. The most significant legislation in this regard was the Gesetz über den Neuaufbau des Reichs [Law on the New Structure of the Reich] of 30 January 1934 which provided that the legislatures of the Länder were abolished, the sovereignty (Hoheits) rights of the Länder were transferred to the Reich (i.e. national) government, and the Land governments became subsidiary to the Reich government. On its face (and indeed according to the authoritative commentators) this made the Land governments simply parts of the Reich. When the new Reichsdienstflagge was adopted 31 October 1935, all Land offices would then fly instead of the Land flag, the new Reichsdienstflagge. Arguably, this might have already applied to the old service flag from 30 January 1934, but as far as I know it seems not to have done so. The 15 September 1935 Reichsflaggengesetz did not explicitly mention Land flags (except perhaps by implication, as indicated). Mattern and Neubecker 1985 [mne85], p. 60, says that all Landesflaggen and Landesdienstflaggen (service flags) were forbidden in 1935 by the Zweite Verordnung zur Durchführung des Reichsflaggengesetzes [Second Ordinance for the Implementation of the Reich Law on Flags], art.2 (1), paragraphs 2 and 3. I do not have a date. The date of this ordinance would be close to that of the order establishing the 1935 Reichsdienstflagge. Mattern and Neubecker 1988 [mne88], p. 81, states that all Prussian provincial colors were forbidden in 1936. I do not have a law or a date on this either. While cities traditionally had the right to bear arms, municipalities in Prussia were not entitled to them until 1933. In the years thereafter, many municipalities in Prussia...adopted arms. A number of the newly adopted or changed arms of this time owed their symbolism to Nazi ideology. Therefore, after 1945, all civic arms in Germany were taken under scrutiny, and swastikas and other deprecated symbols had to be removed. The German Länder were never eliminated. The Gaue were the designations of the party districts, not of the subdivisions of the state. In a technical sense, the Länder continued in existence; however, their importance and power were undermined by the Gleischschaltung and by the fact that simply the Gauleiter had more actual power than the Land government (in many cases, the same persons anyway). As with many developments in the Third Reich, there was a huge gap between de jure and de facto situations. Technically speaking, the Weimar Constitution stayed in force (de jure) during the Third Reich. De facto the Ermächtigungsgesetz was the "constitution", at least it is called like that by historians today. Marcus Schmöger is unquestionably right. The Länder continued in existence to the very end of the Nazi regime - 1943 and 1944 almanacs and the like all list them - although their governments became part of the national structure by the Gleichschaltung laws of 1934 to 1935. One must not confuse Gaue which were territorial units of the Nazi party with Reichsgaue which were units created for newly annexed territory (with occasional territorial adjustments). Why they did not create new Länder I do not know, but I think that it reflected their desire to undermine territorial loyalties. Failure to abolish them probably reflects desire to utilize, rather than offend historical identifications. Now it is getting complicated. My source is Manfred Scheuch, Atlas zur Zeitgeschichte - Europa im 20. Jahrhundert. The Gesetz über den Neuaufbau des Reiches (law about the new structure of the Reich) was adopted on 30th January 1934. The parliaments of the Länder were eliminated. The territorial and justice rights of the Länder were given to the Reich. The Ministerpräsidenten (prime ministers) of the Länder were replaced by Reichsstatthalter (governors) which were nominated directly by the Führer. Only Prussia kept his Ministerpräsident, Hermann Göring. In 1938 there were 38 Gaue in the 14 Länder of Germany. When Austria was annexed, the so-called Ostmark got its own Reichsstatthalter. 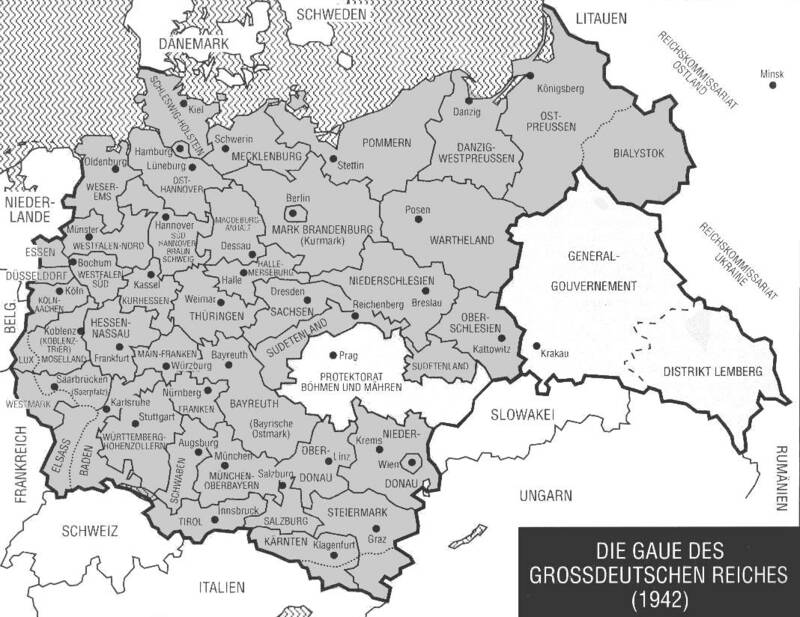 Later each of the seven Gaue of Ostmark and Sudetenland got its own Reichsstatthalter and were changed into Reichsgaue. During the war other Reichsgaue were created: Danzig-Westpreußen and Wartheland in the East, Baden-Elsaß, Westmark (with Palatinate) and Moselland in the West. During the war the simple Gauleiter got more and more rights, so the difference with the Reichstatthalter disappeared. Even the borders of the Gaue did not follow the borders of the Länder, as can be seen in this scan from the above source. From 1934 on, the Länder became mere territorial divisions of the Reich. In terms of seperate power and "states rights", none of the Länder existed after that date. None the less, they continued technically in existence. Actually even the technicalities vanished in irregular fashion. The Landtäge [parliaments] vanished immediately. The individual positions were gradually abolished. For instance, Ludwig Siebert continued to be Ministerpräsident and Finance Minister of Bavaria until his death 1 November 1942, but no successor was named. When Gauleiter Wagner was named Reich Defense Commissioner for Bavaria on 2 September 1939, the Palatinate was specifically excluded. At least city flags were not abolished in 1935, nor completely fallen into disuse after that date, as can be seen from this 1938 Nuremberg flag. Investigating when did the modern variant of the Hamburg castle (without masoning lines) first appear, I came across a semi-official publication the Handbuch der Hansestadt Hamburg...from 1939 [hfh39]...which already showed it. So my interpretation is that after abolishing the Länder flags in 1935 (more or less), the Hanseatic cities were still allowed to use their own flags as city flags. To mark the difference between the old state flag and the new city flag, the drawings were modernized [read on under Hamburg Civil and State Flag.